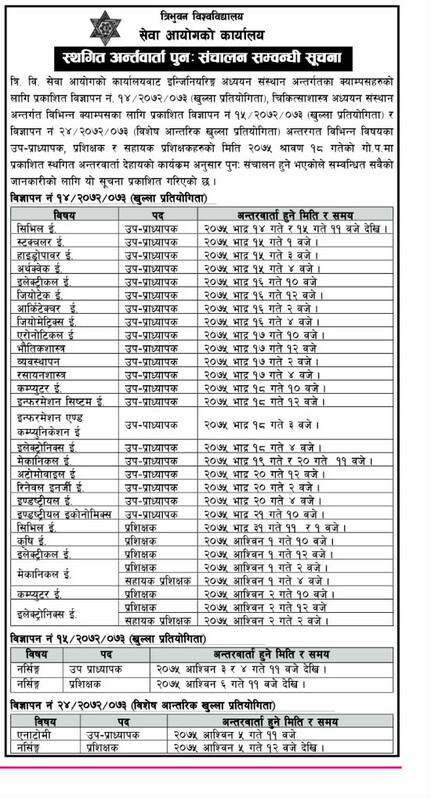 Tribhuvan University Service Commission has published the interview schedule which was previously postponed. The interview will start from 2075/05/14 to 2075/06/06 for the various post. Check TU Service Commission Published Interview Schedule below. Previously published at Gorakhapatra on date 2075/04/18 for the interview which was postponed. Advertise Numbers for the various post is '14/2072/073' '15/2072/073' '24/2072/073'. The maximum post is related to Engineering Teacher for various engineering colleges.